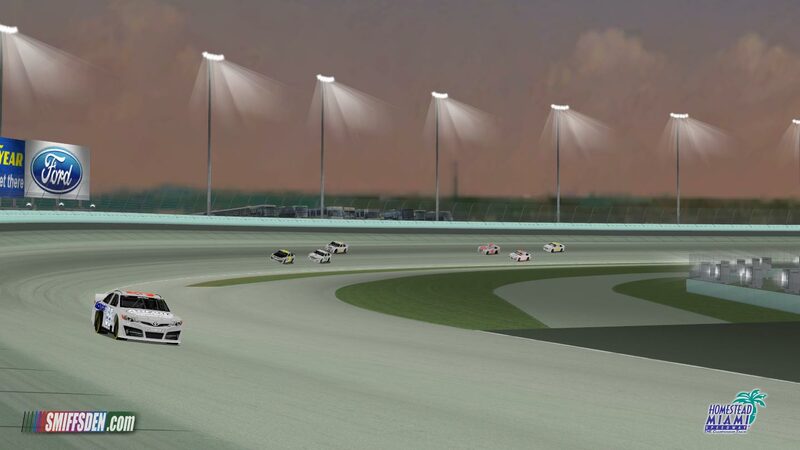 This is an update to the 2010 Smiffsden release of Homestead-Miami Speedway, it is mostly a graphical update, although JR Franklin has completely redone the A.I. Added asphalt to front and backstretch aprons. 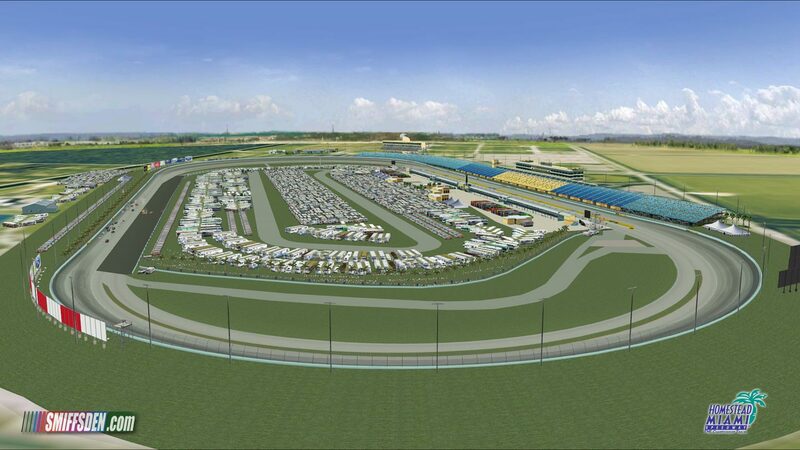 Added a more detailed infield model & added lots of eyecandy. 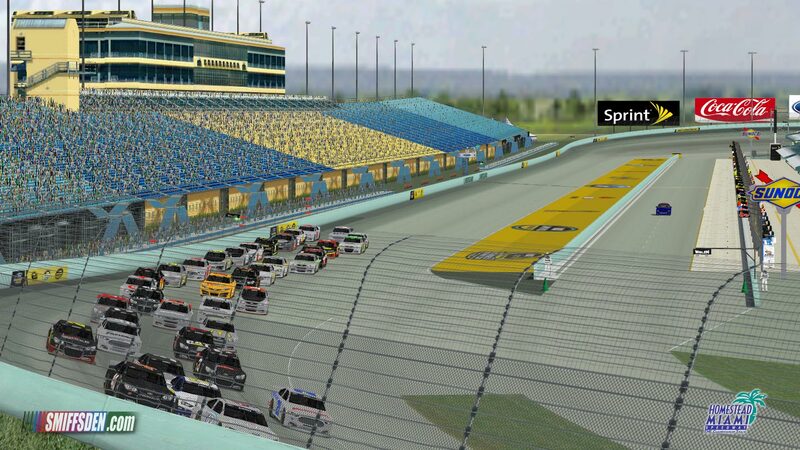 3D Crowd now shows at a realistic attendence level for qualifying and practice. 3D Crowd now shows on it's reverse face (to avoid empty Grandstands on TV1/TV2/Spec cams). Overhauled sky textures (on DtN version). Fixed incorrect horizon and ground images (lake & sea are now in right place). Track is available in Day, Night and Day to Night configurations. Miscellaneous other new objects and textures….too many to mention. 3. the opponent strength set at 97%. Ratings for the car sets used in testing and in developing the A.I. 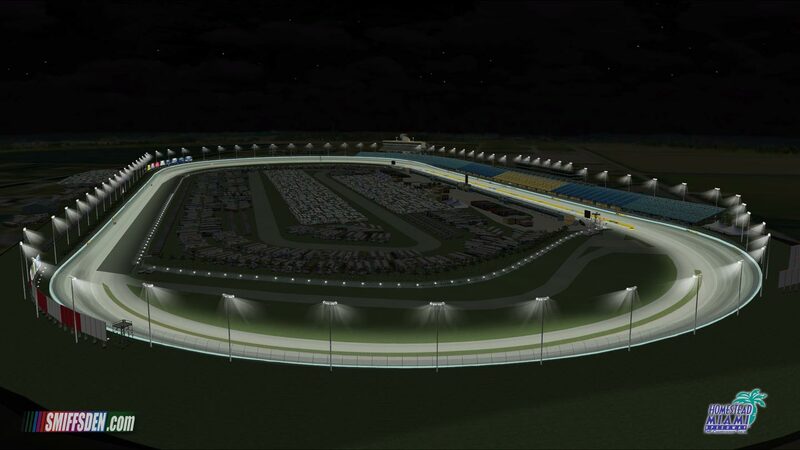 for this track are from the NRatings program (http://www.tjeuten.be/software/nratings/) using the MasGrafx Full Season V3.1 ratings formulas. The A.I. will checkup early in the race, it is especially noticable if you start from the back, this is because they have been programmed to "race" rather than follow the car in front, so in laymans terms, their programming goes something like this "You are too close to the car in front, cannot overtake here, slow down a little", this will result in a checkup that goes way back up the line, and is really noticable when starting from the back. After 3 or 4 laps at most, checkups are no longer an issue as the pack has spread out a bit allowing the cars to race more. We feel that creating the A.I. is better this way overall because once everything has settled down, they will actually race you, defend, try to overtake etc. etc. rather than just following the car infront blindly and never overtaking. In short, we consider it an acceptable compromise to make the racing better later on. There is always a night sky in your mirror, even during the day, on the Day to Night (DtN) edition, this is a limitation of the games graphics engine and is outside of our control. The billboards are best guess and they're not quite in the right position, unfortunately I do not get live race coverage over here (in UK) so have to rely on photos and internet streams for my NASCAR fix. If you are using anything other than the default papy_ai.ini file, the A.I. cars will crash a lot on restarts, either disable cautions, or revert to the default papy_ai.ini for best results, there are no fixes.